AleaSoft, November 8, 2018. The prices of gas, coal and CO2 emission rights futures rose during last week, causing an increase in the main electricity futures markets price, mainly in the yesterday’s session on November 7, according to AleaSoft’s analysis. In European spot markets this week’s trend has been the prices convergence in most markets. The gas and coal futures, which had been trending down since the beginning of October, recovered in yesterday’s session on November 7, pushed by a low temperature forecast for the end of November. According to the analysis carried out by AleaSoft, the European gas futures for December this year increased 0.68 €/MWh compared to the previous day, on November 6. On the other hand, the API 2 coal price for January 2019 in the ICE futures market rose 2.00 $/t with respect to November 6. For the time being, the Brent oil price has maintained the downward trend and in yesterday’s session on November 7, the futures for January 2019 settled at 72 $/bbl, 3% lower than in October 31. According to AleaSoft, the CO2 emission rights prices, which also maintained a bearish path since October began due to investors profit taking, changed the trend and started to rise since November 2 as the introduction of the market stability reserve (MSR) is near. The futures for December 2018 reached the minimum of the last three months on November 1, when they settled at 15.62 €/t, but from November 2 they went up again and yesterday, November 7, were traded at 18.61 €/MWh. 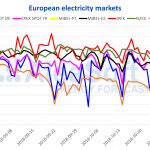 In this context, according to AleaSoft’s analysis, the main European electricity futures markets reacted with increases in the session of November 7. The increase in German electricity futures in the EEX market is remarkable: the December 2018 monthly product rose 2.43 €/MWh with respect to the previous session, on November 6. 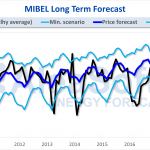 In the MIBEL market, the year 2019 (YR-19) price rose 0.95 €/MWh for Spain and 0.73 €/MWh for Portugal in the session of November 7 with respect to the previous day. Regarding the European spot markets, this week of November 5 they converged around 60 €/MWh, with the exception of the Nord Pool Nordic market, which has been below 50 €/MWh and the N2EX British market which has been around 67 €/MWh. 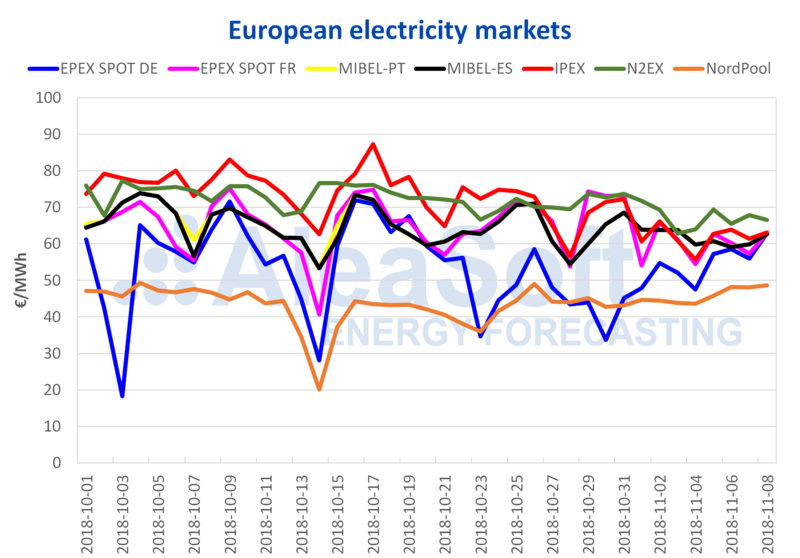 It should be noted that this week the EPEX SPOT German market, which is generally lower, also converged with the rest of the continental European countries due to lower wind energy production in Germany. According to AleaSoft, it is expected that next week of November 12, the average temperature in mainland Spain will be higher than this week. This will cause electricity demand to rise 0.62% compared to this week. AleaSoft forecasts that price for next week will increase because lower wind energy production is expected, and will move between 60 €/MWh and 61 €/MWh.